Newcomer Family Obituaries - Rowen Richard Bradley Newsome - Newcomer Cremations, Funerals & Receptions. Rowen Richard Bradley Newsome, age 7 months of Xenia, passed away Tuesday, February 5, 2019 at Greene Memorial Hospital. He was born June 28, 2018 in Centerville, Ohio the son of Ryan and Alexis Newsome. 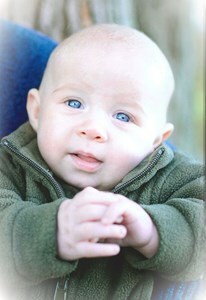 Rowen was our miracle baby who brought abundant joy to his family. He had a radiant smile that brightened our world. He was so loved! To celebrate his life the family requests that all in attendance at the funeral wear bright colors. Rowen is survived by his parents, sisters, Aliyah Lorena Newsome, Adilynn Ruth Newsome; brother, Reuben Ryan Newsome; grandfathers, Richard Dean Mickle, Brad Tate Newsome and Barry Miller; grandmothers, Angelia Marie Mickle, Michelle Lynn Newsome and Linda Sue Miller; great-grandmothers, Sandra Kay Mickle, Deborah Sue Knisley and Kay Bowman; great-great grandmother, Zelpha Koogler; great-grandfathers, Michael Leroy Knisley and Fred Bowman; uncles, Richard Mickle, Jacob Mickle, Roland Newsome, Roman Newsome and Cole Edwards; aunts, Amanda Mickle and Kara Edwards. He is also survived by numerous family and friends. Funeral Service will be held on Monday, February 11, 2019 at 11:00 am at Xenia Nazarene Church (1204 West 2nd Street, Xenia, Ohio 45385). Visitation will also be February 11, 2019 from 10:00 am to 11:00 am at Xenia Nazarene Church. The family suggests memorial contributions be made to St. Jude Children's Research Hospital. To share a memory of Rowen or to leave a message for his family please click the share button above. Add your memories to the guest book of Rowen Newsome. Ryan & Alexis & family, I want to just convey my heartfelt condolences to you at the loss of your baby boy. Mark & I were able to attend the funeral service (we sat in the balcony because we arrived last minute). Although we didn't get to greet you personally, we certainly grieve & rejoice along with you: grief for your deep loss; joy that he's with Jesus & that you'll reunite with him one day. Alex, it's been years since we've talked, but we remember our family connection in years past through soccer and Cedarville University with fondness. Ryan, we've never met, but want to connect here with you as well. We were deeply moved by the memorial service, especially the time when your relatives surrounded you in prayer. I took a picture of that from the balcony & would love to send that to you if you'd like. What a blessing that service was, as you gave glory to God despite your all-encompassing grief! Our prayers on your behalf continue! II Corinthians 1:5 For just as the sufferings of Christ flow over into our lives, so also through Christ our comfort overflows. My deepest sympathies. Holding your family in prayer. God's garden must be beautiful- He always takes the best. To Remember God's children are in his care and purpose. God Bless your Family in Faith and Trust in Jesus Christ our Lord. May God comfort and bring peace to each of you. Keeping you all in thought and prayers. I'm so sorry to hear about your precious Rowen. Although we are apart for now, baby Rowen's footprints are forever on my heart, until heaven when we reunite. The nights I spent holding you in my arms will forever bring me joy and happiness. Your sweet hands on my cheeks, your tender giggle as you played with my hair, your sweet eye contact as you drank your bottle of Momma's sweet milk, are what I will always remember whenever I think of you. You brought me many hours of joy and delight. I can't wait for my heavenly hugs from you my dear boy.